Note: This is an oldie from the archives, but I thought I’d bring it back out to kick off October with a little Halloween fun! 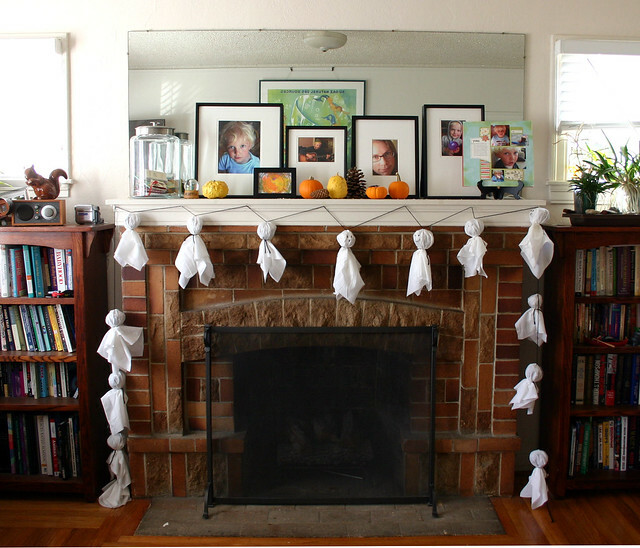 Here’s a fun Halloween craft that Wyatt and I made last weekend — a ghost garland! Zach needed to work and I’m too scared to take both boys to the park by myself (Wyatt’s a runner!) so I needed a project that we could do around the house that would keep Wyatt out of the office. I’ve seen kits for these strings of ghosts at the craft store, but I couldn’t imagine that they would be difficult to put together and I was right. I had initially planned to use big sheets of newsprint for the ghosts, but I couldn’t find my big pad so I used some cheap muslin instead. 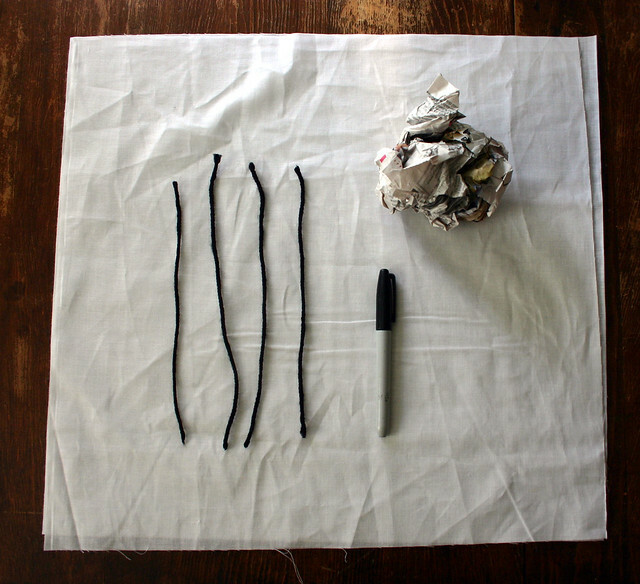 I’m much happier with the cloth than I would have been with the paper, so I’m kind of glad my newsprint went missing. Wads of newspaper — I found that a two page spread was just the right size. Wad one of the sheets of newspaper into a ball. This is a great job for your child. 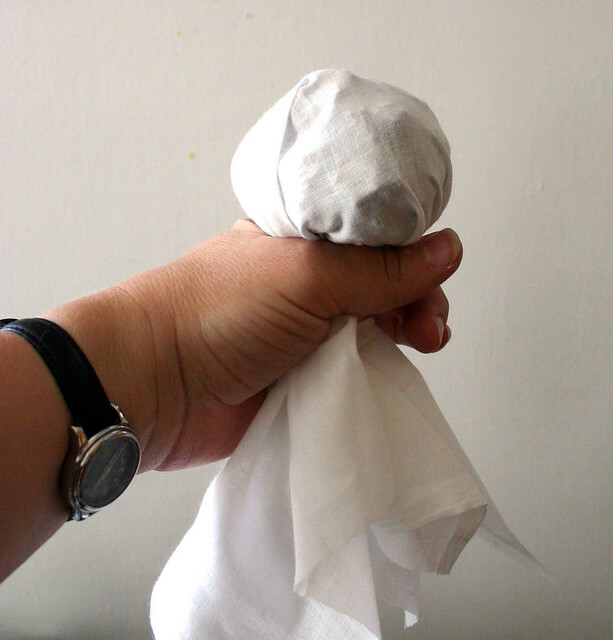 Hold up the wad of newspaper and drape one of the squares of cloth over the top. 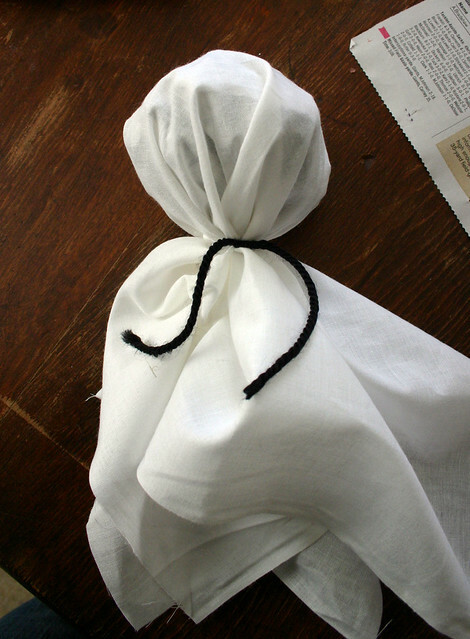 Cinch the cloth to make a “neck” for the ghost. 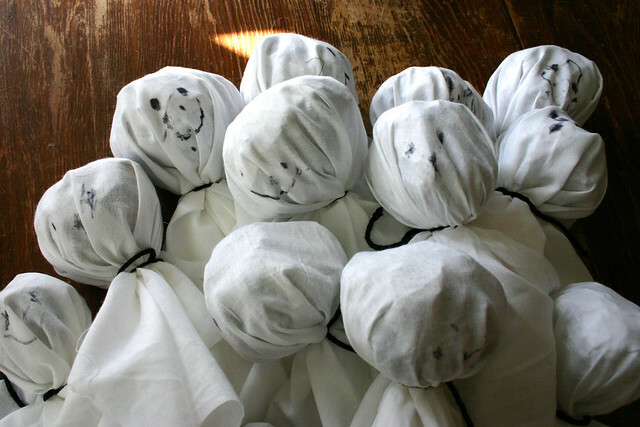 Wrap the string around the ghost’s neck and knot it. 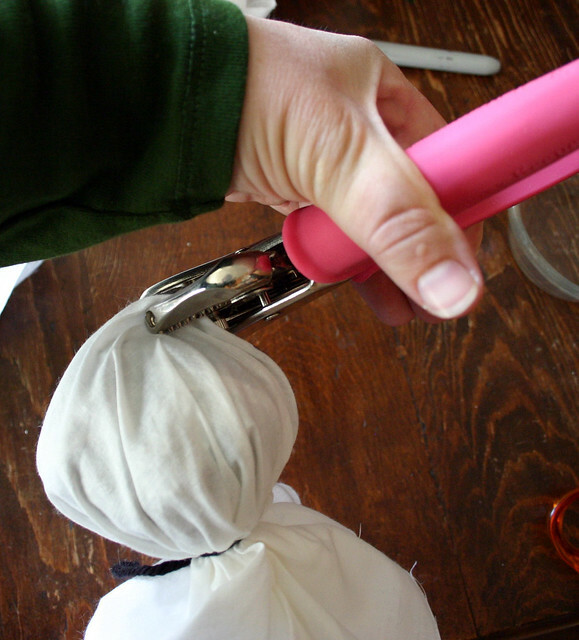 Trim the ends if you like. I didn’t bother. 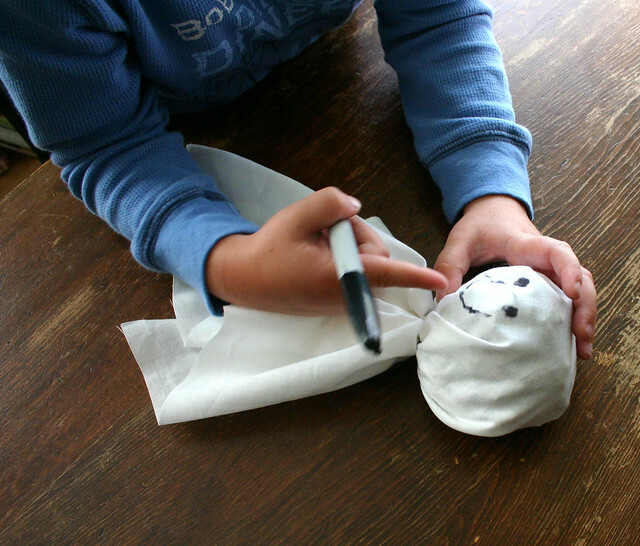 Draw a face on your ghost. We made happy, sad and smooky…I mean, spooky faces. Repeat, making as many ghosts as you’d like. We made 14. 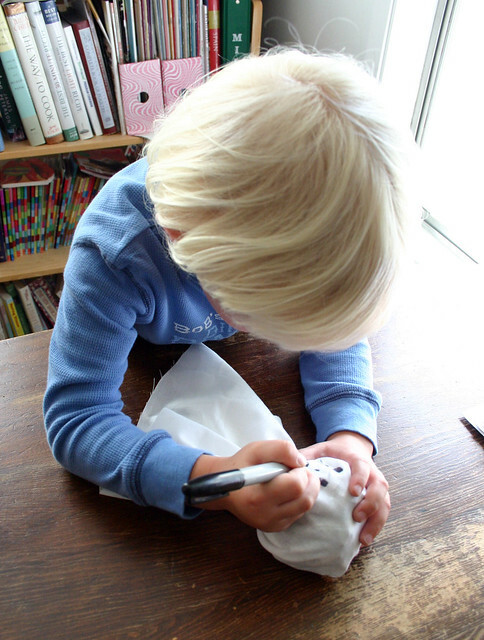 Poke two holes in the top of your ghost about a half inch apart. I did this by folding the fabric at the top in half and then using a hole punch to punch about 1/4 inch down from the fold. 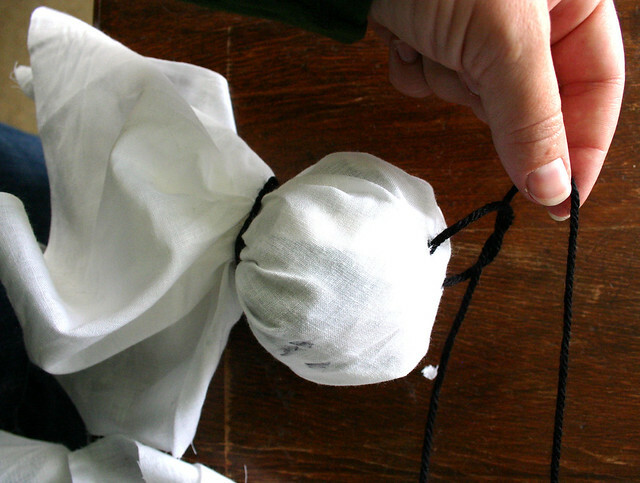 String one ghost at a time onto a long piece of yarn or string, tying a simple knot to fasten it to the string. Repeat for each additional ghost, spacing them about 12 inches apart. I started in the middle of the piece of string and worked my way to one end. Then I started on the other side of the string and went the other direction. Ta da! Now you have a fun Halloween decoration. 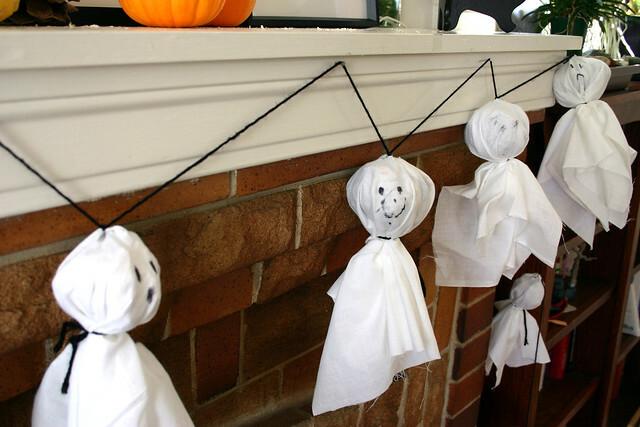 We hung ours along our mantle, but this could be fun out on a front porch or something if you used weather-resistant materials inside the ghost instead of newspaper.